The knucklehead was a Harley-Davidson motorcycle engine, so named because of the distinct shape of the rocker boxes. The engine is a two cylinder,45 degree,pushrod actuated overhead valve V-twin engine with two valves per cylinder. 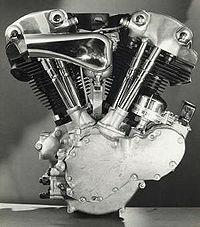 It was the third basic type of V-Twin engine used by Harley-Davidson, replacing the Flathead engined VL model in 1936 as HD's top-of-the-line model. The engine was manufactured until 1947 and was replaced by the Panhead engine in 1948.The Knucklehead engined models were originally referred to as "OHVs" by enthusiasts of the time; the nickname "Knucklehead" arose from the California chopper culture of the late 1960s. Being faster and more advanced than any of the opposition (i.e. Indian) and played a great role in transforming Harleys from reputedly being something of an old man's bike to a real sportster. It was replaced by the Panhead in 1947. As the design of Harley-Davidson engines has evolved through the years, the distinctive shape of the valve covers has allowed Harley enthusiasts to classify an engine simply by looking at the shape of the cover. A knucklehead engine has round knobs on the cover resembling knuckles that give the knucklehead its name. ↑ Margie Siegal (November/December 2005). 1977 Harley-Davidson custom FLHS. Motorcycle Classics. Retrieved on 2009-08-18. This page was last edited on 24 August 2010, at 01:46.